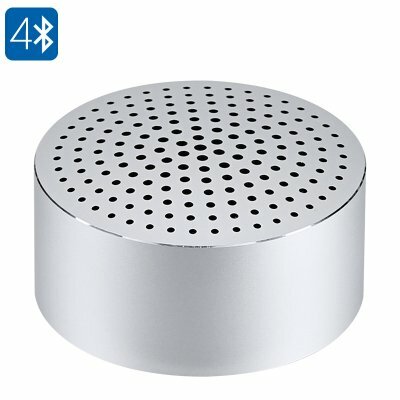 Successfully Added Xiaomi Mi Mini Bluetooth Speaker - 480mAh Battery, Noise Reduction, Hands Free, Bluetooth 4.0, Tough Aluminum Alloy (Silver) to your Shopping Cart. This portable Bluetooth speaker from Xiaomi certainly is one of the most compact wireless speakers that currently are available on the market. Featuring a simple yet modern design, this high-end Xiaomi Bluetooth speaker allows you to listen to your favorite tracks wherever you are in style. Whether you use it as a stylish addition to your current electronics at home or for listening to those all time classics while out in the park – this Bluetooth speaker is guaranteed to meet your audio demands. Thanks to its miniature and highly portable design, the Xiaomi wireless speaker can be conveniently carried along inside your pocket – allowing you to take it with you wherever you’re headed. A picnic in the park, relaxing afternoon at the beach, or simply at home – from now on you’ll always be able to enjoy your favorite songs. Being compatible with the vast majority of Bluetooth-enabled devices out there, this wireless speaker provides the perfect way to listen to music on the go no matter whether you’re using a smartphone, tablet, or any other type of media player. Additionally, it is also compatible with both Android and iOS operating systems. Its powerful Bluetooth 4.0 connection ranges up to 5 meters, providing you with maneuverability whilst enjoying your playlist. Capable of producing 53dB, you can be assured that the Xiaomi Mi Bluetooth speaker lets you blast out your tracks loud enough for everybody in the area to enjoy. Equipped with a lightweight yet powerful 480mAh lithium battery, this wireless speaker provides you with enough juice to listen audio for up to 4 hours without needing to worry about running out of juice. When recharging is necessary, the built-in battery can be easily powered up through the speaker’s micro USB port. Besides delivering audiophile-grade music quality and numerous hours of continuous playing time, this wireless speaker furthermore packs a built-in microphone that lets you engage in hands-free phone calls at any given moment. From now on you’ll never have to reach for your phone again during an incoming call as you’ll be able to speak straight into this magnificent Bluetooth speaker – making it perfect for engaging in convenient phone calls not only at home or outside, but also whilst driving your car.